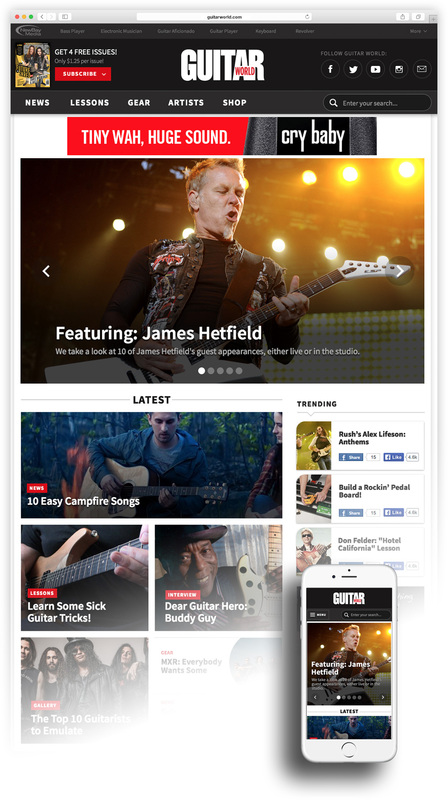 The #1 highest circulation music-making magazine in the world, Guitar World has been an advocate for guitarists around the world for 30 years. These days content is more than just text—it's rich and full of life. Interesting imagery and headlines should make browsing content fun for the visitor. 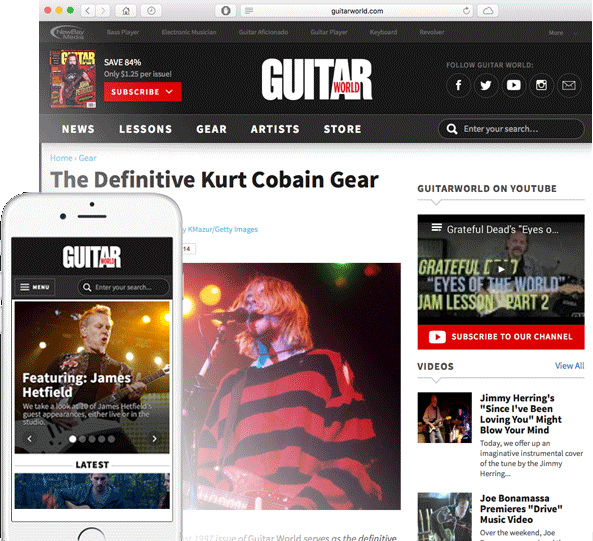 We highlighted this concept and created a modular approach for the Guitar World team to display their content. This helps keep the look of their site consistent yet fresh. 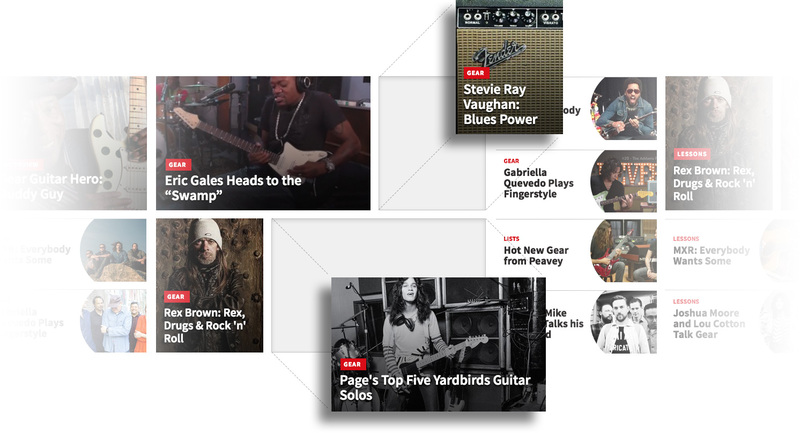 Sidebar Content – We designed a global sidebar that can be customized on a page-by-page basis. 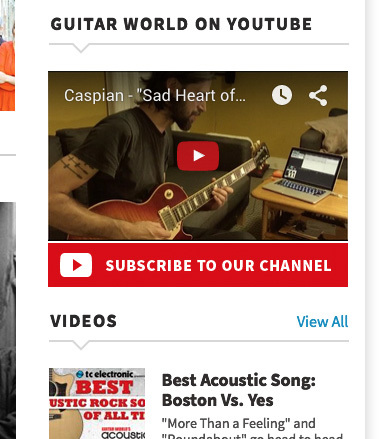 This includes relevant content as well as good placement for their sponsored ads. 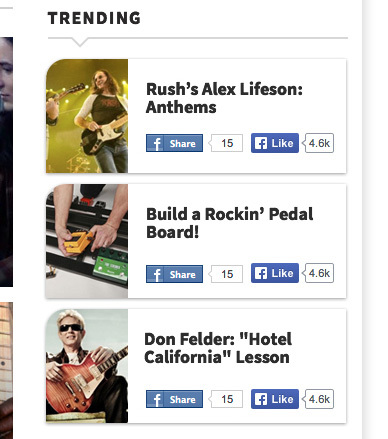 Trending – We created a trending section in the sidebar to show popular topics. This was important to keep the visitors engaged in different topics that may interest them. Finding desired content shouldn't be a burden on the visitor. 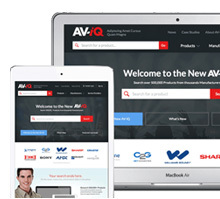 We were able to improve the process of finding desired content by creating a newly designed navigation, taxonomy structure and improving the search options. On the web, readability is extremely important, and this is especially true for a global publication. We improved the readability of their site by utilizing the right typography as well as sizing and spacing of elements. We also introduced a new great way to view photo galleries, which was something that was missing from their old site. Photo Gallery – Any article that has a photo gallery attached will display the gallery in two ways. 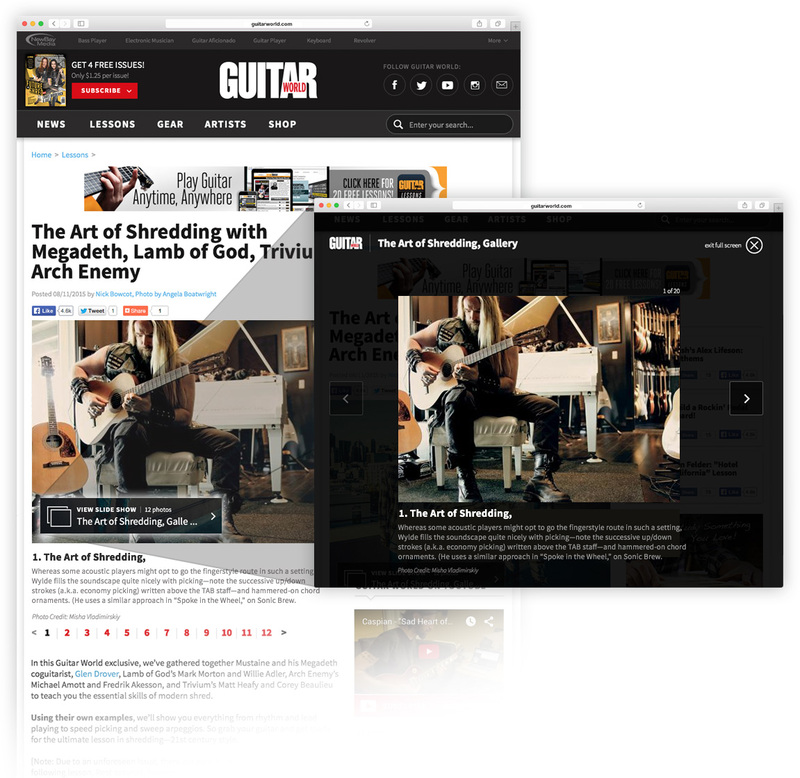 It can be navigated from within the article page itself or brought into a beautiful fullscreen view. 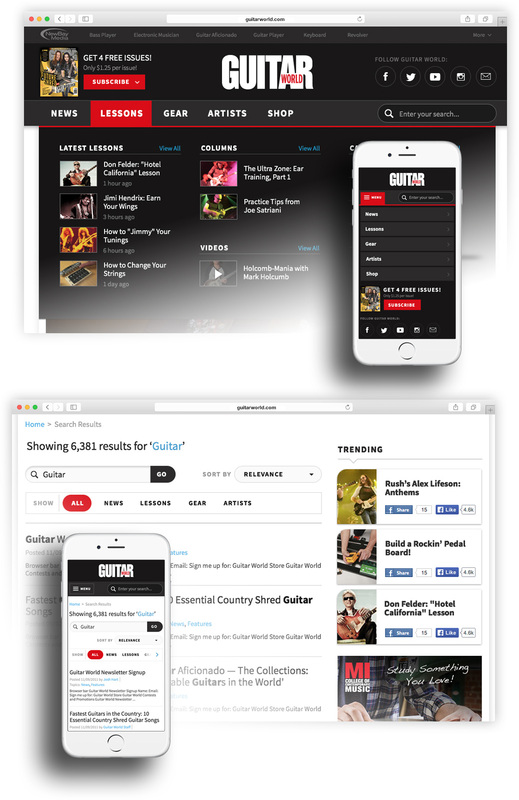 From the onset of this project, our main goal was to improve the experience for the visitors of GuitarWorld.com. Learning their habits and understanding their needs allowed us to craft a beautiful new website and deliver the content they want. 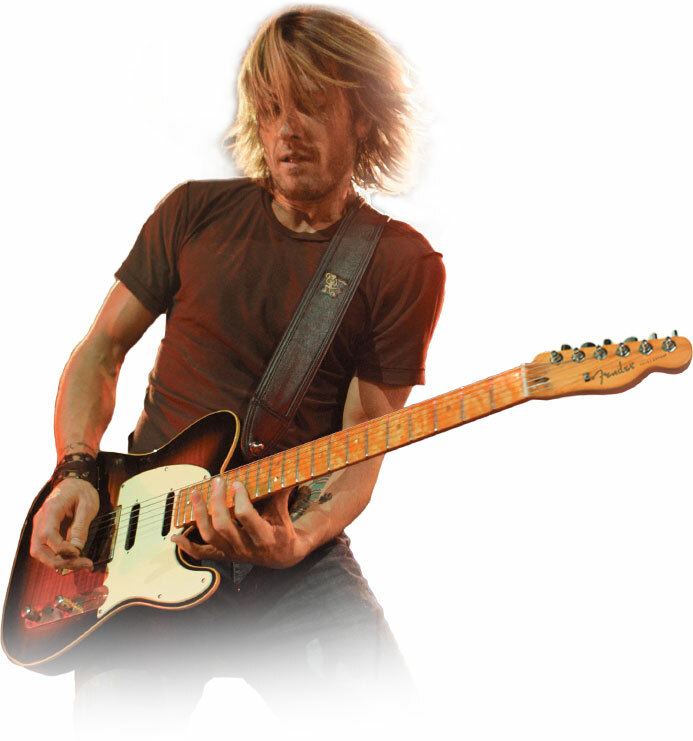 To find out more about Guitar World click here.